There seems to be a lot of interest in this subject lately based on the number of people asking about the Sabbath rest. Here is the very first Sabbath in scripture. "And on the seventh day God ended his work which he had made; and he rested (shabath) on the seventh day from all his work which he had made. 3 And God blessed the seventh day, and sanctified it: because that in it he had rested (shabath) from all his work which God created and made." We know that the concept of a seven day week was continued. When Jacob complained to Laban about receiving Leah instead of Rachel, Laban told Jacob to give Leah her week and then he would give Rachel to Jacob as well. The word week comes from shabuwa and means sevened or in other words a seven day week. Although not canonical the Book of Jasher, which is twice referenced in the Old Testament, showed Moses obtaining a Sabbath for the people while he still lived in Pharaoh's house. This will be a little longer quote to show the story. "And he daily went forth and came into the land of Goshen, where his brethren the children of Israel were, and Moses saw them daily in shortness of breath and hard labor. 47 To you, all the children of Israel, thus says the king, for six days you shall do your work and labor, but on the seventh day you shall rest, and shall not perform any work, thus shall you do all the days, as the king and Moses the son of Bathia have commanded. 51 And Moses became great in the eyes of all the Egyptians, and in the eyes of all the children of Israel, seeking good for his people Israel and speaking words of peace regarding them to the king." The next mention of a Sabbath is when Moses returned to Egypt to free the children of Israel. Pharaoh complained to Moses that one of the reasons they wanted to go worship God was because the people rested. "And they said, The God of the Hebrews hath met with us: let us go, we pray thee, three days' journey into the desert, and sacrifice unto Yahweh our God; lest he fall upon us with pestilence, or with the sword. 5 And Pharaoh said, Behold, the people of the land now are many, and ye make them rest (shabath) from their burdens." The next mention is in Exodus 16, four chapters before the contract Law, the ten commandments, was given. "And it came to pass, that on the sixth day they gathered twice as much bread, two omers for one man: and all the rulers of the congregation came and told Moses. 23 And he said unto them, This is that which Yahweh hath said, To morrow is the rest of the holy Sabbath unto Yahweh: bake that which ye will bake to day, and seethe that ye will seethe; and that which remaineth over lay up for you to be kept until the morning. 25 And Moses said, Eat that to day; for to day is a Sabbath unto Yahweh: to day ye shall not find it in the field. 28 And Yahweh said unto Moses, How long refuse ye to keep my commandments and my laws? 29 See, for that Yahweh hath given you the Sabbath, therefore he giveth you on the sixth day the bread of two days; abide ye every man in his place, let no man go out of his place on the seventh day. 30 So the people rested on the seventh day." Notice that four chapters before the giving of the ten commandments God called the Sabbath one of His commandments and one of His laws in verse 28. 11 For in six days Yahweh made heaven and earth, the sea, and all that in them is, and rested the seventh day: wherefore Yahweh blessed the Sabbath day, and hallowed it." At this point I can hear many say, "Well that is fine, but we live under the new covenant." So to the New Testament we shall go to show that the Sabbath continues today. There is one mention of Sabbath in the gospel of Matthew that would be of concern after the death of Christ. Since most believe that the keeping of a Sabbath ended with the death of Christ this instance is important. It was Christ himself who mentioned it. "But pray ye that your flight be not in the winter, neither on the Sabbath day:"
Here Christ was telling people that they should pray that their flight from Jerusalem in 70 A.D. not be on the Sabbath. I am sure that Christ knew that the event he was foretelling was to be well into the new covenant. It was 37 years after the new covenant took effect. In Luke 23:56 the women who prepared spices for the body of Christ rested on the Sabbath. Would they have not known that it was no longer necessary? Surely Christ would have taught them. However look at what the scripture says. "And they returned, and prepared spices and ointments; and rested the Sabbath day according to the commandment." According to the Bible the Christ has died at this point in time thus making the new covenant active. However the scripture here says that keeping the Sabbath was according to the commandment of God. This is a good time to interject one particular thing that many think is a part of the Sabbath. God's Law does not include any ordinance concerning a distance one could travel on the Sabbath. That law is a creation of the Pharisees and should be ignored. However it was common in the time of Christ to refer to the distance allowed by the Pharisees as a Sabbath Day's journey. Acts 1:12 mentions it. I do not think that it adds to or subtracts from any discussion concerning the validity of the Sabbath. It was merely a convenient method of measure. There are several mentions in Acts of Paul attending the weekly gathering on the Sabbath to teach. The apostles and elders in Acts 15 and 16 referred to the Sabbath without objection. Acts 20:7 and 1 Corinthians 16:2 are used by many to attempt to prove a first day of the week gathering. However there is no statement in those accounts that one can draw any more than a sufficient inference. There is not enough information for one to make any necessary inference. Briefly in regard to the phrase "the first day of the week" I would like to suggest that it really should have been what the Greek says, "first of Sabbaths". Please look and note that each time that phrase occurs in the new testament it is at a specific time of the year. The phrase was used for one specific Sabbath in the spring. There is one other time when a specific Sabbath was mentioned. Luke 6:1 mentions the second Sabbath after the first. Please consider that if the Sabbath had been officially changed it would seem to me that we would have seen the apostles meeting and making regular mention of meeting on the first day of the week. There would also probably be some explanation of why they did so. Then we would have more than one occurrence and more information to go by. Many of you know that 1 Corinthians 16:2 has nothing to do with a meeting of the saints, but only tells the saints to set aside money by them (at home) so that it would be available when needed. Preachers are reluctant to teach that for fear the offering would diminish. 17 Which are a shadow of things to come; but the body is of Christ." Colossians 2 is sometimes mentioned to try to diminish the Sabbath. However these verses really serve to show it's continuation and that the Sabbath of today is just a shadow of what it will be in the next age. This is a good spot to include Isaiah 66. "For as the new heavens and the new earth, which I will make, shall remain before me, saith Yahweh, so shall your seed and your name remain. 23 And it shall come to pass, that from one new month (chodesh) to another, and from one Sabbath to another, shall all flesh come to worship before me, saith Yahweh." It should be obvious that this prophecy has not yet happened since we are still not on the new earth as mentioned in verse 22. Hebrews 4:1-11 goes right along with Isaiah. In fact in almost every verse in Hebrews 4:1-11 the word rest occurs. In all but one instance the word rest is translated from the Greek word katapausis which means rest. However in verse 9 the Greek word is not katapausis. The word found there is sabbatismos. The verse should have been translated as follows. "There remaineth therefore a Sabbath to the people of God." One common misconception is that the Sabbath is only a particular day. It is a day, but mainly it is, as the name implies, a rest. The Sabbath was made for man. So unless one thinks that in this modern era we have evolved and no longer need or require rest then we should consider that a weekly rest is given to us because God knows we need it. Now after all that I will say that we can not obey the original Sabbath due to how our calendar works today. So we must do what we can and make sure that we take 24 hours each week for a rest (Sabbath). The idea is to rest from work, but one does not have to stay in bed or stare at a wall. "If you turn away your foot from the Sabbath, from doing your pleasure on my holy day; and call the Sabbath a delight, and the holy of Yahweh honorable; and shall honor it, not doing your own ways, nor finding your own pleasure, nor speaking your own words". Apparently some were turning the Sabbath into a huge party. It is to be a restful time at home with your own family. I am inclined to believe that the original Sabbath day of God occurred from noon till noon rather than sunset to sunset. I believe the sunset evening Sabbath to be a corruption that was brought from Babylon. In Genesis chapter 1 a day is mentioned as "And the evening and the morning" were such and such day. If you consider that a day began at noon, when the sun begins to set, then evening and morning can represent 24 hours. May I suggest Saturday noon till Sunday at noon. That way one could include church in one's Sabbath. All day Sunday or whatever day one is able to observe it is fine if one follows the guidelines we have from God for it's observance. 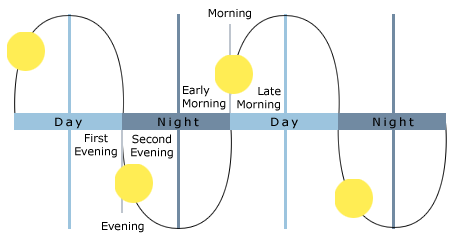 Here is a drawing that shows the evening and morning being a day. And He said to them, The Sabbath came into being for man's sake, and not man for the Sabbath's sake. Therefore the Son of Man is also Lord of the Sabbath. How does the above work if the Sabbath is now destroyed or Is the Son of Man Lord of something that has been destroyed?